(15 October) This issue will repeat the Sail Area Math essay. The November issues will present Sail Oklahoma 2011! 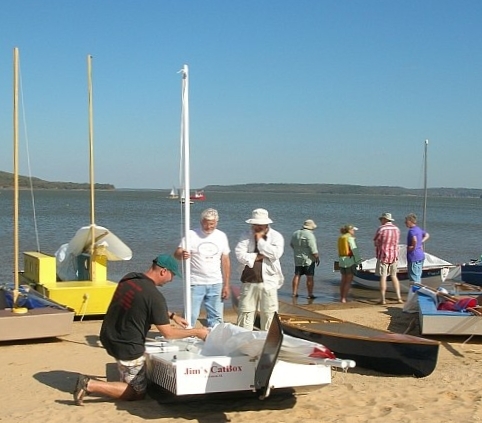 A perfect sunny day and boats gather at Sail Oklahoma 2011. 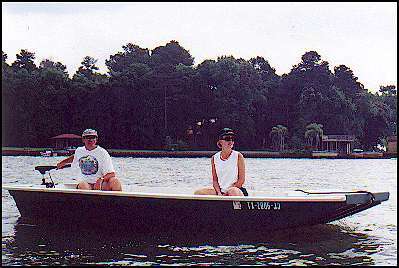 In the photo of Chuck's boat you can see the wide open center that I prefer in my own personal boats. 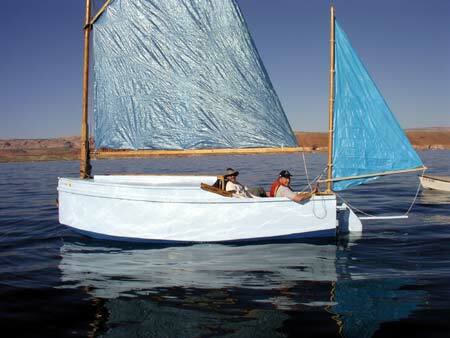 To keep the wide open boat structurally stiff I boxed in the bow, used a wide wale, and braced the aft corners. I usually study the shapes of commercial welded aluminum jonboats. It's surprising to see the little touches the builders have worked into such a simple idea. I guess they make these things by the thousands and it is worth while to study the details. 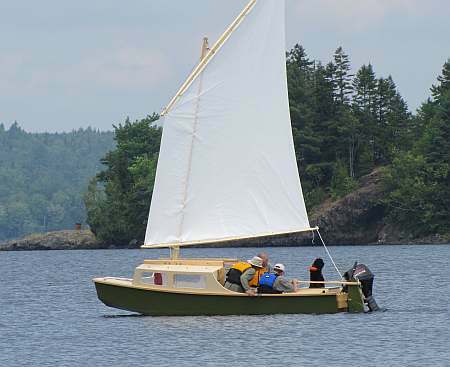 Anyway, Jonsboat is a plywood copy of a livery boat I saw turned upside down for the winter. What struck me about that hull was that its bottom was constant width from stem to stern even though the sides had flare and curvature. When I got home I figured out they did it and copied it. 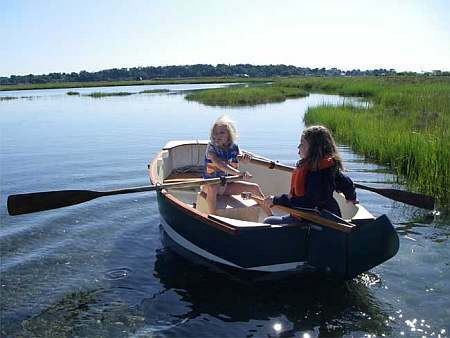 I don't know if it gives a superior shape in any way but the bottom of this boat is planked with two constant width sheets of plywood. The installation presented a few interesting thoughts. First I've been telling everyone to stick with 10 hp although it's well known that I'm a big chicken about these things. Greg reported no problems and a top speed of 26 mph. 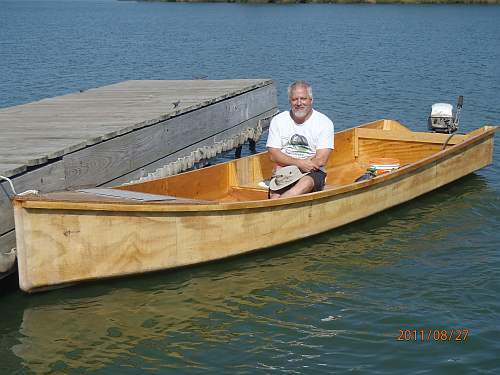 I think the Coast Guard would limit a hull like this to about 25 hp, the main factors being the length, width, flat bottom, and steering location. Second, if you look closely at the transom of Greg's boat you will see that he has built up the transom in the motor mount area about 2". 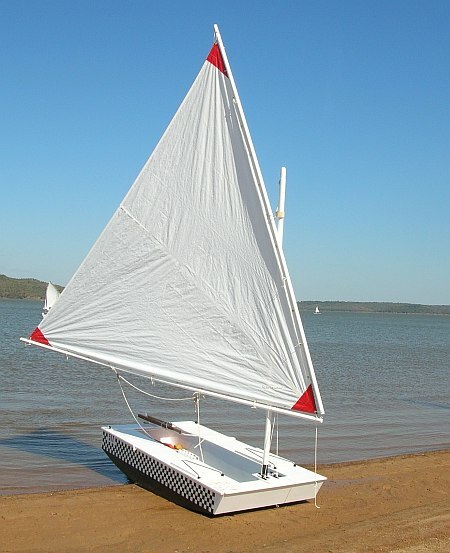 When I designed Jonsboat I really didn't know much about motors except that there were short and long shaft motors. I thought the short ones needed 15" of transom depth and didn't really know about the long shafts. 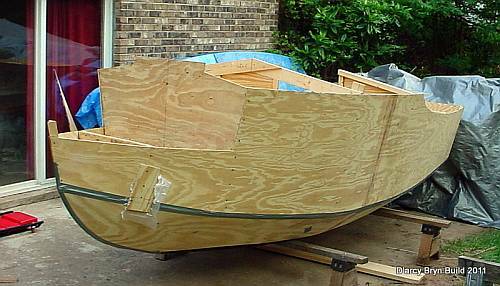 Jonsboat has a natural depth of about 17" so I left the transom on the drawing at 17" and did some hand waving in the drawing notes about scooping out or building up the transom to match the requirements of your motor. I think the upshot of it all is that short shaft motors need 15" from the top of the mount to the bottom of the hull and long shaft motors need 20". There was a lot of discussion about where the "cavitation" plate, which is the small flat plate right above the propellor, should fall with respect to the hull. I asked some expert mechanics at a local boat dealer and they all swore on a stack of tech manuals that a high powered boat will not steer safely if the cavitation plate is below the bottom of the hull, the correct location being about 1/2" to 1" above the bottom. But Greg had the Nissan manual and it said the correct position is about 1" BELOW the bottom. Kilburn Adams has a new Yamaha and its manual says the same thing. So I guess small motors are different from big ones in that respect. But it seems to be not all that critical, at least for the small motors. 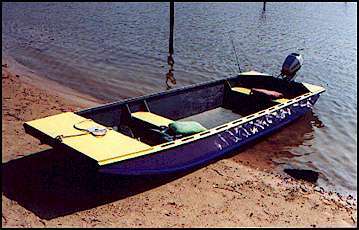 Greg ran his Jonsboat with the 18 hp Nissan with the original 17" transom for a while and measured the top speed as 26 mph. Then he raised the transom over 2" and got the same top speed! There is nothing to building Jonsboat. There five sheets of plywood and I'm suggesting 1/2" for the bottom and 1/4" for everything else. It's all stuck together with glue and nails using no lofting or jigs. I always suggest glassing the chines for abrasion resistance but I've never glassed more than that on my own boats and haven't regretted it. The cost, mess, and added labor of glassing the hull that is out of the water is enormous. My pocketbook and patience won't stand it. Glassing the chines and bottom is a bit different because it won't show and fussy finishing is not required. 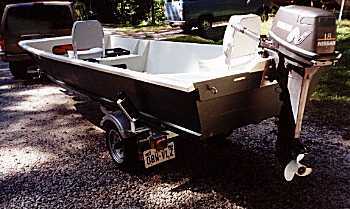 Plans for Jonsboat are $25. Here is a Musicbox2 out West. 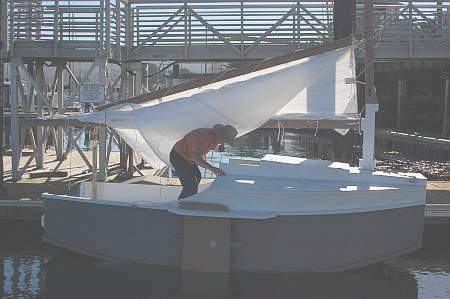 Jackie and Mike Monies of Sail Oklahoma have completed this Catbox. 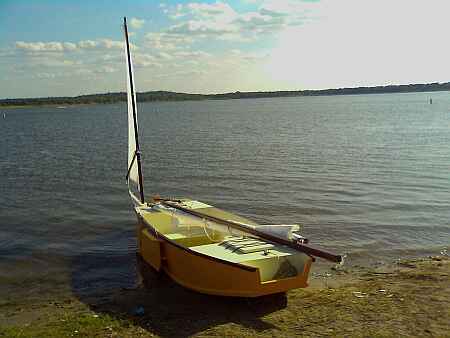 I sailed it at the meet and it is a keeper. Full report very soon. 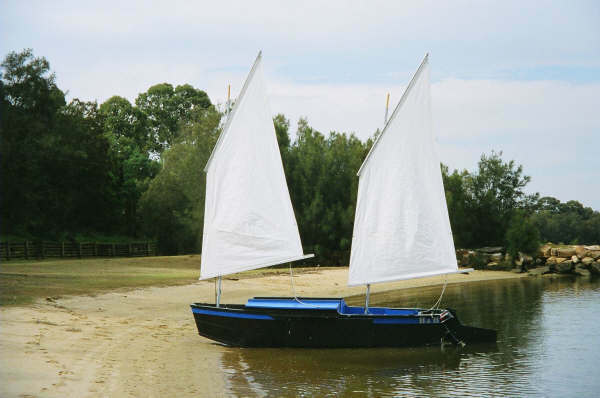 And the first Brucesboat is in the water for testing. A full report soon.